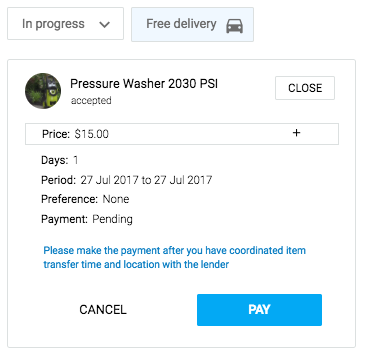 Once your item request has been accepted, arrange with the lender a pick-up and drop off time. Before you pick up the item (or get it delivered), you need to pay for it through Quupe. You can do this by logging onto Quupe, and selecting 'Messages'. Once in 'Messages', select the appropriate item/lender. On the left hand side of the screen, there should be a small 'Pay' icon. Click on it. Ta-da! Your rental has been paid for. 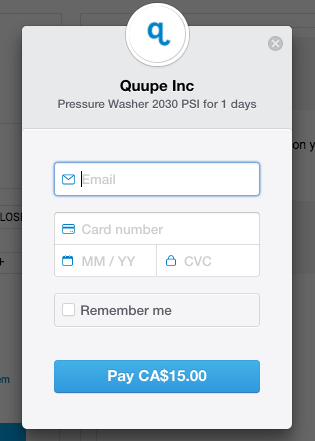 Quupe uses Stripe to process payments, making it secure for both borrower and lender.